Hi lovelies! As our wedding day draws near, (6 weeks to go! ), honeymoon planning is finally underway! As of right now, we don't have anything booked - I'm pre-writing this post, so that may have changed by now, but who knows - (edit, we now have two honeymoons booked, but more on that later0, but for me, one of the most exciting things about going away is the new wardrobe that comes with it! I always buy new clothes for every holiday anyway, but I feel like a honeymoon in particular deserves a whole new wardrobe! On our first holiday as Mr and Mrs, I want to make sure I look and feel fab at all times, so that includes on the beach, out at night and even when I'm off to bed! That being said, an entire new holiday wardrobe can be very pricey, so inexpensive websites like Shein are fab for those pretty, summery holiday outfits that you perhaps won't get much of a chance to wear twice. I just hate spending lots of money on clothes that I know I'm very unlikely to wear again (not including my wedding dress in that statement of course! ), so prices like these are perfect. The colour scheme I've gone down with this wishlist may give a little hint to where we're thinking of booking for our honeymoon, so watch this space! I just love blue and white on holiday and not just to match the flag of the country I'm visiting! 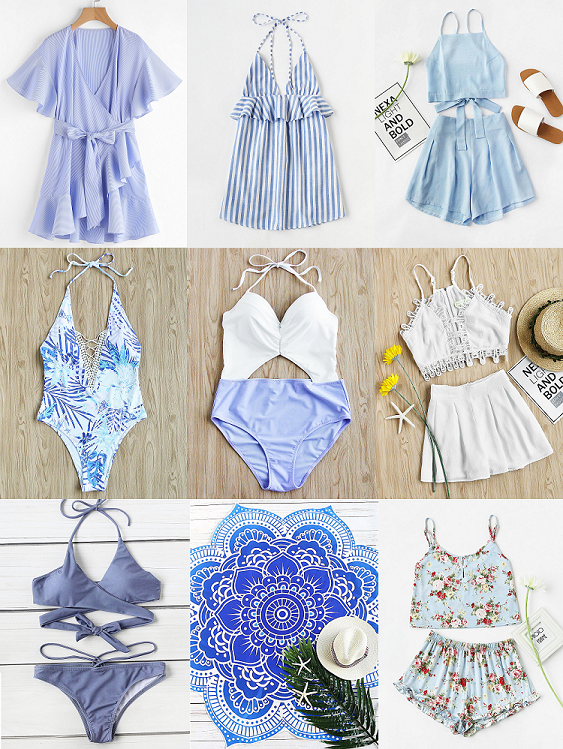 I adore every single item in this wishlist but my absolute favourites are the printed swimsuit, white two piece and the gorgeous beach blanket. These shaped beach blankets seem to be a major thing right now and I am obsessed with them! Hi lovelies! As you will likely know if you've even glanced in the direction of my blog or social media before, I'm getting married, very soon actually, in just 6 weeks time. So of course, a huge part of my Bridal prep, is taking good care of my skin. This extends to my whole body and not just my face! As you may also know, for a good few years before I started at the job I'm in now, I worked as a beauty therapist. You may think this means that I preach waxing every inch of your body and shun razors, as any good beauty therapist should. You'd be wrong. I hate waxing, there is no denying that it's much better, the hairs eventually grow back less, the results last longer and... well that's pretty much it. The downside is that it's expensive if someone else does it for you, it's messy if you do it yourself, it hurts and you've got to grow your hairs out before getting rid of them. As someone who has a real issue with even the tiniest amount of body hair, I just can't wait it out. Before this turns into a 'confessions of an ex-beauty therapist' post (idea logged, however), I'm going to get to my actual point. Basically, I hate waxing, hair removal creams friggin' stink and I'm certainly not about to fork our for laser removal, so shaving it is. That being said, as much I love shaving for the speed, convenience, low cost and the fact I don't have to stay hairy for a moment longer than necessary, it doesn't mean there are no downsides. No matter what I do, I have never mastered the fine art that is shaving your entire body without at least one or two (it's more than one or two) nicks and cuts along the way. 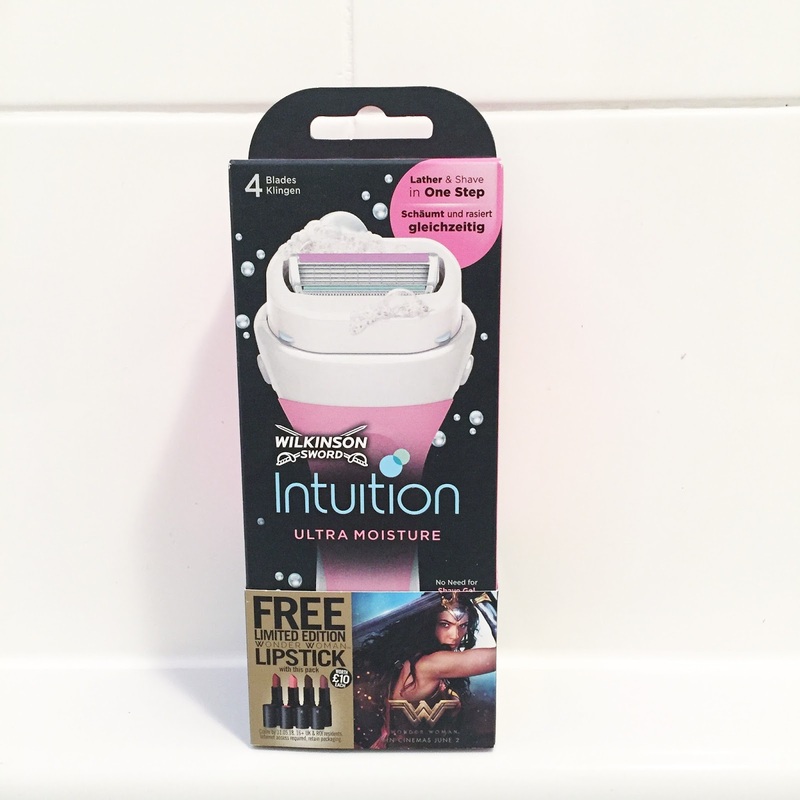 So, when I saw the Wilkinson Sword Intuition Razor on sale in Tesco for just £4.33, I thought, yeah, why not? 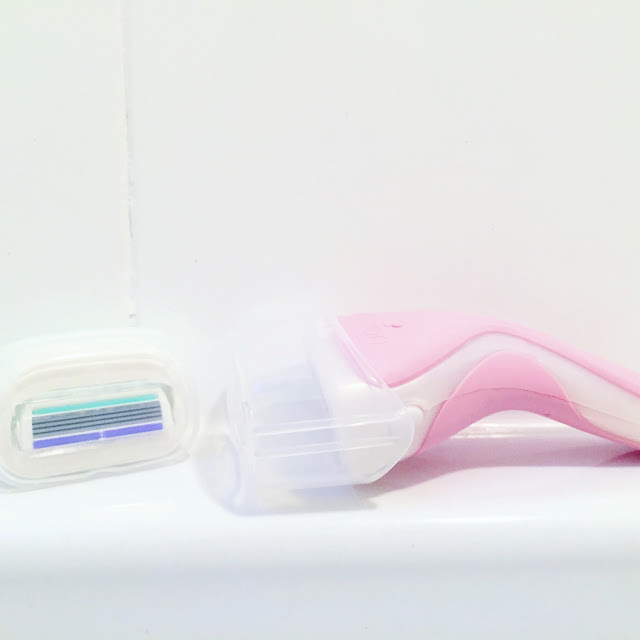 A razor isn't typically something I'd review, whether I liked it or not but I have been sharing this with just about everyone I know and thought it may be useful to some of you too. This razor claims to lather, shave and moisturise all in one step. Seemed like a pretty hefty claim to me. I was always a firm believer that all razors were the same and that all I needed was a decent shaving foam and any old razor would do, including those little supermarket own brand two blade ones (sorry legs). I was wrong. Just the first time after using this I couldn't help but sit stroking my legs, telling my fiancé, friends and mum to stroke my legs and telling people how amazing my new razor was. Let's face it, a razor is a pretty dull thing to bang on about, but I've been using this for a few weeks now and I honestly don't want to use anything else ever again. As it's summer and I've also been tanning in actual sunlight rather than from a bottle, it's even more important to me that I keep my skin soft smooth and moisturised so my tan lasts as long as possible for my wedding day, so this razor has helped massively. 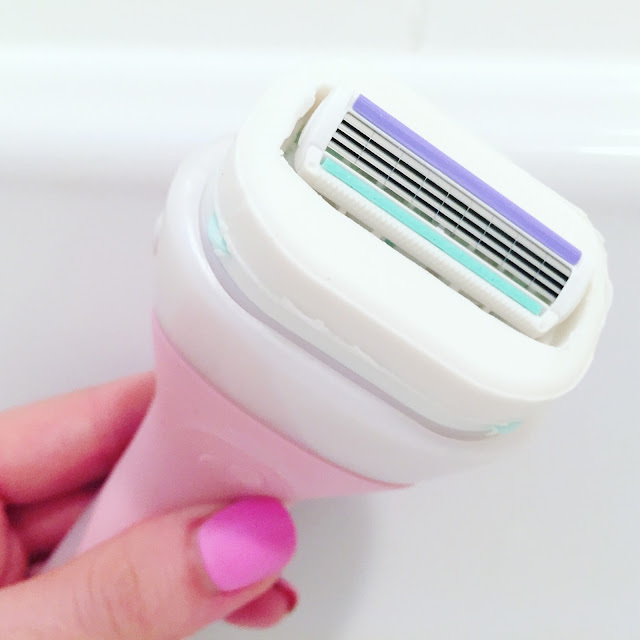 Typically, I tend to get little cuts and sometimes razor burn in the form of little red dots on my legs in particular, but this has been totally eliminated with this razor. My skintone and texture has never been so smooth and even! Another bonus, because the razor itself is surrounded by what looks and feels like a bar of soap, it doesn't even feel like you're shaving, it's the most bizarre feeling. The first time I used it, I honestly didn't feel like it was working as it just felt like I was running a bar of soap over my body. It does work though and gives a smooth, pain free shave with literally no cuts! I won't harp on any more, as I know it's already getting weird how much I'm going on about this razor, but honestly, next time you're in Tesco, do yourself a favour and pick one of these up while they're still on offer and give it a go. You won't regret it! Hi lovelies! It is officially less than two months (7 weeks 6 days to be precise but who's counting?) until my Wedding, so right now, I am obsessed with all things Bridal! We got engaged in early July last year and the last year has just flown by, as we both got new jobs last year and moved house earlier this year, the Wedding felt as though it was on the back burner for a while, but now, with such a short amount of time today, I am back in full on Bride-To-Be mode again, Pinterest and I have had a magical reunion, my face turns into the heart eyes emoji at anything with 'Mrs' monogrammed onto it and listening to our first dance song makes me squeal. I am a Woman obsessed. As I'm sure you'll be aware though, Weddings don't only take up a lot of your time but they also take up a bloody lot of your money! That's why brands like Boohoo coming out with gorgeous Bridal ranges makes my heart sing. With my Hen Party coming up, finding all these gorgeous pieces on Boohoo was seriously exciting. 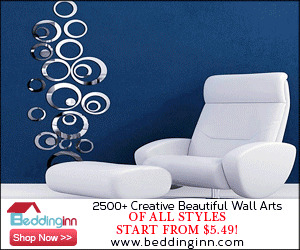 All these products are seriously affordable and actually tasteful, which is a big deal to me! I'm not an L-Plate and shot glass necklace kinda girl (no hate, do you), so these pretty rose gold sashes, bride headband and temporary tattoos are just the right balance of pretty and tacky for me. I have to admit, I do actually already have the robe, my sister bought it for me a while back and I love it! It'll be the perfect thing for getting ready in o the morning of the Wedding. Our Wedding is in August, so it'll (hopefully) be pretty hot on the day, so a big fluffy dressing gown is not going to cut it. This one is lovely and light and amazing quality too, I can't wait for it to feature in mine and my girls getting ready pics! On the flipside, I have no idea when or where I'd wear the t-shirt, but being a huge rock/ punk music fan, this one seemed pretty appropriate. Perhaps something to wear to a pre-wedding concert.. something to think about?! What do you think? If you're a bride/ bride to be/ bridesmaid etc, what shops did you find most useful for wedding/ hen party bits? I'd love to know! *This post is not sponsored (though as if I'd say no!) I just really love Boohoo right now!